Cyanovisions - Initial Studies is a series of living and non-living art works that considers our relationship to our changing environment, ecosystems and microorganisms. 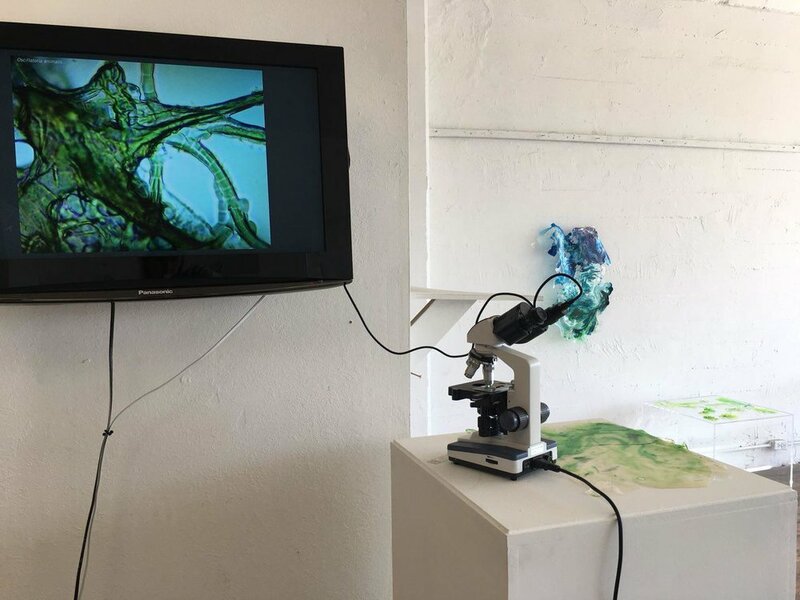 These works focus on the global environmental phenomenon of harmful algal blooms of cyanobacteria as intertwined with human development and waste, our technological fetishes, and the increasingly biotechnological landscape of earth. Cyanovisions delves into what it means to be alive, the earth as an organism, and questions what life human societies deem as valuable. As the science of one age is often the mythology of the next, Cyanovisions aims to blur the lines between science fact and fiction, and to imagine more symbiotic and multi-species futures. 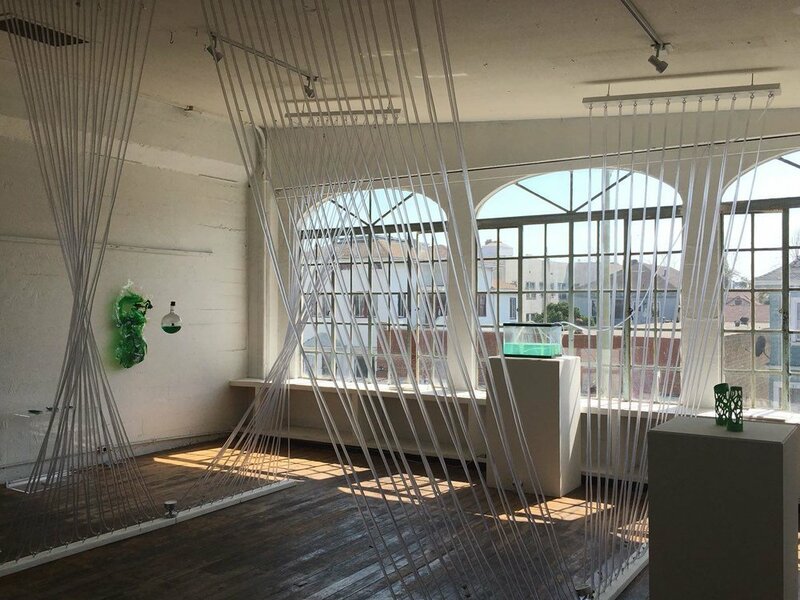 The exhibition of Cyanovisions - Initial Studies includes the incubation of 5 strains of Cyanobacteria - Oscillatoria Tenius, Oscillatoria Animalis, Anabaena, Spirulina, and Gleocapsa; an immersive installations as a speculative photobioreactor made with Dasha Ortenberg, and a series of bioplastics. Cyanobacteria cultures were sonified and magnified in different variations, especially to show the weaving of biofilms produced by the different Oscillatoria strains, and their filaments. An immersive photobioreactor made of 800 feet of food grade tubing houses the growth of Spirulina. The bioplastics on display are experiments for wearables and textures for garments from different bioplastics using laboratory equipment as molds for creating new forms. Cyanobacteria are ancient organisms that were the first to create oxygen on the planet, and ultimately our atmosphere and all oxygen dependent lifeforms today. With global temperature rise and human development unchecked, cyanobacteria proliferate as harmful algal blooms in rivers, lakes and estuaries around the world at increasing rates, creating cyanotoxins and eutrophication events that can suffocate other species. As the element first created by this ancient life form sustains us, we in turn generate the pollutants that stimulate its unmitigated and toxic growth. Humans, although inadvertently responsible for the extinction of other species, also create new species and life forms through synthetic biology, genetic engineering, and artificial life. Humans currently grow superfood from cyanobacteria and can potentially harness energy from them and other microalgae. What would the future look like if humans and cyanobacteria merged membranes, genes, and metabolisms, similar to the symbiotic bacteria that make up 90% of our bodies? Cyanovisions hopes to reposition our relationship to cyanobacteria by showing the beauty of it's different forms and highlighting the evolutionary history of these organisms - viewing them on a geological timescale versus a human timescale. It questions what is perceived as toxic as aggregations of these ancient and intelligent organisms could very well be an attempt to bring ecosystems back into balance. Blending speculative fiction with the biological sciences, Cyanovisions imagines a future where cyanobacteria and other microbial life are seen as divine creatures for having once created our atmosphere on the planet, as well as for their nitrogen fixing capabilities and their ability to live in almost every habitat on the planet. Growth of cultures in the laboratory can be seen as a form of worship.